Urban Angle’s Cheers and Jeers is an ongoing look at the best and worst of our urban environment, celebrating those who are making a difference, large or small, and kindly encouraging those who should do better. Do you have an amazing or terrible or amazingly terrible place to share? Let us know in the comments, and we’ll take a look! Today’s Cheers and Jeers heads to Baltimore Street to share progress on accessible Downtown streets, but within view of one of the worst offenders. Milwaukee Deli’s ADA Ramp is the final loose end of a Downtown preservation success story. 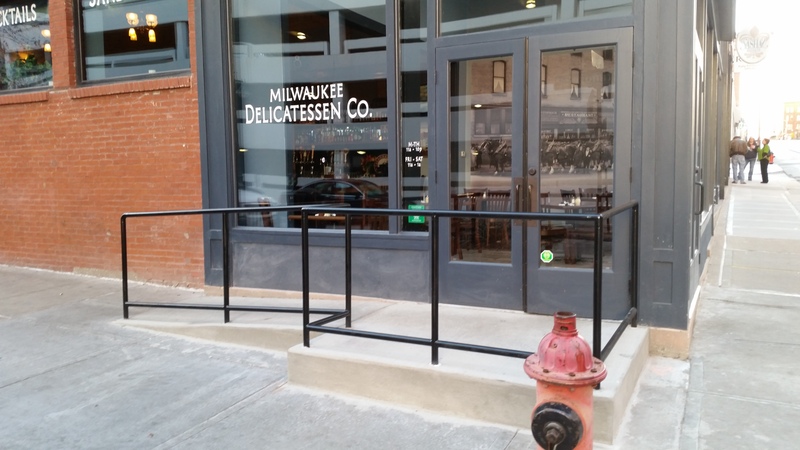 It certainly took a while (delayed by the notorious “underground vaults” – Kansas City’s go-to excuse for avoiding Downtown street improvements), but the wheelchair ramp is finally in place at Milwaukee Deli. The Cosby Hotel, which houses Milwaukee Deli, has been downtown’s feel-good preservation story, with a last minute rescue from the wrecking-ball, meticulous restoration, and beloved new tenants serving delicious food. This project at 9th and Baltimore had everything going for it except for those few inches separating the sidewalk from its front entry. The new ADA ramp removes the asterik from this Downtown success, and sets an example for other historic Downtown properties. 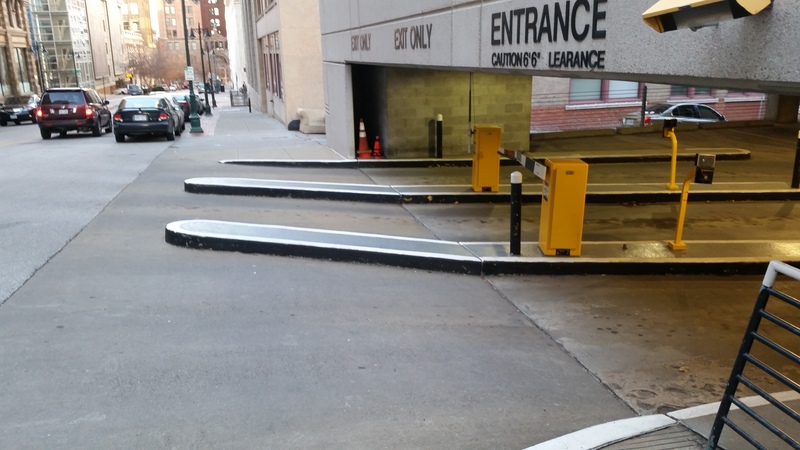 These parking garage barriers extend all the way through the sidewalk, forcing anyone in a wheelchair into the street. But at least the (non-existent) parking queues will be organized! Unfortunately, just a block away is one of the worst examples of anti-pedestrian, inaccessible design. Best practice for driveway design include a change in pavement color or height to signal to a motorist that they are entering a pedestrian pathway. The parking garage entry on the east side of Baltimore between 10th and 11th appears to spurn this idea out of spite, actually extending multiple pedestrian barriers through the entire width of the “sidewalk.” Anyone who happens to be in a wheelchair is quite literally forced into the street to navigate this stretch of sidewalk, with the challenge compounded by a steep, angled slope that will unceremoniously dump you into the garage if not careful. And to what end? There isn’t even the excuse for other downtown garages of protecting a structural element. Surely we can do better than this. Ha, half a block away. That’s about the state we’re at in KC currently. Feels like things are coming together, though!